This entry was posted in Dating, Online Dating, Romance, Single Life, Women and tagged bad date, Dating, OKCupid, online dating, plenty of fish, scary, stalker by Belle of the Library. Bookmark the permalink. He is full of it. He was trying to turn the whole thing on you once it finally penetrated his skull that he wasn’t getting anywhere near you again and you were completely willing to get the cops involved. He was being manipulative and standing your ground was the right move and if you ever see him again don’t doubt your gut. He sounds like a stalker and I’m not trying to freak you out, but he found you on several different sites, then found you in person, he not only had your personal stats memorized but used them in conversation. You better believe I’d be freaking out. I don’t know what state your in, but I know you have guns, might want to consider carrying for a while, just in case. Better to have it a not need it than the other way around. If that feels like too much how about a full size maglite in your car and pepper spray on your keys? Just be safe and mindful, these two posts really set off alarms for me. It might be a geography difference I grew up in Nevada and have lived the rest of my life in California expect for six years abroad in multiple countries. I’ve never been to the middle states, maybe it’s safer, but if I were you, I’d be carrying, and I would have told all my family and friends about him and supplied a picture from his profile…just in case. It could always be nothing, that could be the end of it and all this is for no reason, but that would be good news. Know what I mean? I’ll likely take my pepper spray into the gym if it’s not very crowded. I think he was embarrassed and trying to take the blame off himself, honestly, but yeah, it was super creepy. To be clear, I haven’t heard from him in a week. I’m pretty sure it’s over, but I do own guns and pepper spray. I also go to the only gym in town, so I genuinely think he saw me by coincidence and recognized me. I’m still taking the pepper spray, though. I found my stalker on Match. After I met her in person and saw that she was not the person in her pictures, I blocked her and cut off all communication. Then I found out her real name, which I naturally Googled, only to learn that there’s another blogger out there who’d been similarly stalked. The last time I saw her was when she showed up at the courthouse when I had to be there for a car accident thing. I have no idea how she knew I’d be there, but it was tres creepy. Good luck with your nut-case. I hope he’s gotten the message and will leave you alone now. Wow! Super scary. I’m hoping my thing is over. I haven’t heard from him in a week. Let’s hope meanness repels him. Whoa, that’s really creepy! Unfortunately I’ve had similar online dating experiences. I hope it doesn’t put you off too much. I think you have been more than clear to him, so we can only hope he’ll be sensible and leave you alone. 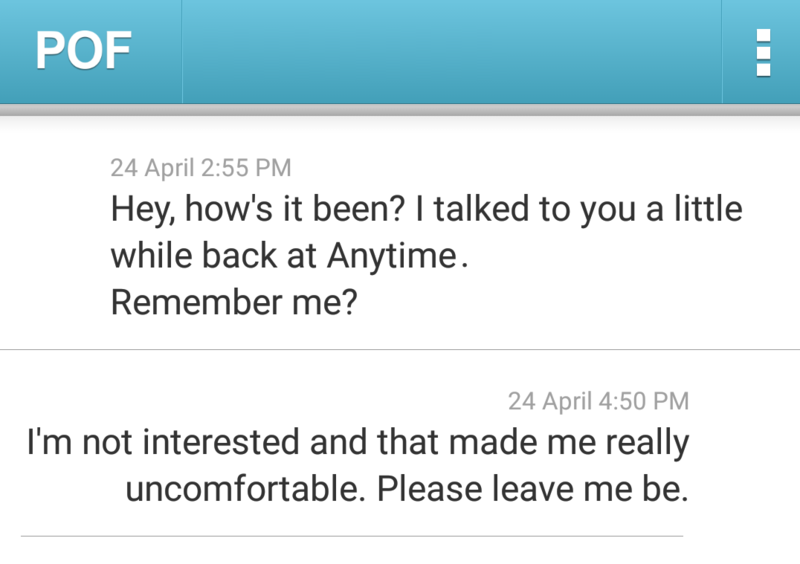 I haven’t heard from him since and it’s been almost two weeks, so I’m not too concerned anymore. 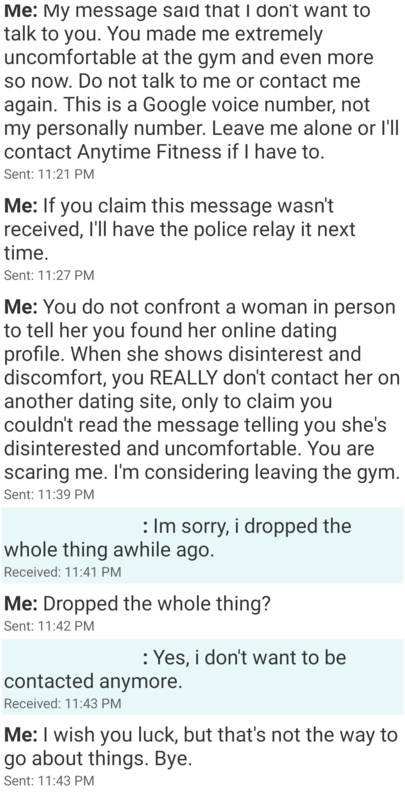 I’m still dating online, because this is the first super creepy incident I’ve had and it’s just such an easy way to meet people.